Designed for business professionals who spend most of their time mobile, traveling between high-level meetings. Passive Noise Cancellation (PNC) uses the mechanical design of the headset to physically block noise from entering the ear. PNC is most effective for filtering out high frequency sounds such as office conversation. Power on the earbuds and follow the voice instructions to pair to your smartphone. Power on the earbuds and plug the Bluetooth adapter into your PC/Laptop to connect. Alexa, play messages. Hey Siri, Cancel my 5 p.m. appointment. OK Google, Where is my next meeting? Alexa, create a to-do. Hey Siri, What appointments do I have tomorrow? OK Google, Set alarm for 10 a.m.
With just the touch of a button you can be more aware of your surroundings with hear through, which conveniently filter in the sounds that surround you. Sound demo is for illustration only. Actual experience may vary. Jabra Direct makes sure that your headset always has the latest firmware, guaranteeing you’ll have the most up-to-date features, bug fixes and easy access to compatibility updates. With the user-friendly Direct Dashboard, staying current has never been easier. Our products work out of the box1 and let you combine perfect sound quality with great comfort. Check compatibility with all systems. 1Jabra is certified with all major communication platforms but as a minimum, all Jabra USB devices will work as audio only. How does Evolve 65t differ from the Elite 65t? Evolve 65t has improved microphone performance for professional calls. 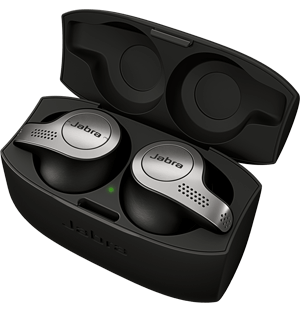 It is SfB and UC-certified and comes with a Bluetooth adapter (Jabra Link 370) to connect to your laptop or PC. There are also minor visual changes. Evolve 65t is IP55 verified. Hence, it is protected from low pressure water jets from any direction. Yes. If you put the left earbud back in the case, you can use the right one solo. However, you cannot use the left earbud on its own. Yes. Jabra Evolve 65t has speakers optimized for both calls and music. What is the difference between standard UC models and models that are certified for Microsoft Skype for Business? If you use the Bluetooth adapter (Jabra Link 370) provided in the box, you will get up to 10 meters/ 33 ft of wireless range from your laptop whilst on a softphone call or listening to music. Yes. Jabra Evolve 65t comes with a leatherette travel pouch included in the box. 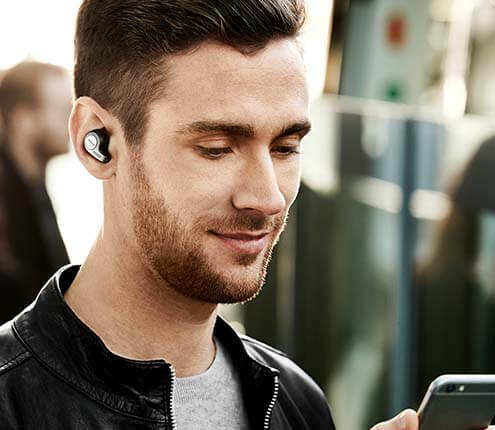 For more frequently asked questions please visit the Jabra Evolve 65t support page. Use the drop-down menus to compare the Evolve models. * See facts on Jabra.com/commercial-claims.